I’m not talking about politics here. 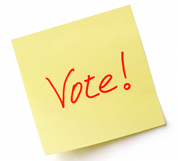 The ins and outs of voting in a modern democracy is well outside the remit of this blog. I’m talking about voting in a work context. Sticky dots on post-it notes, fist of five (raising your fingers to show how support or otherwise), secret ballets etc. etc. I’m sure there are valid circumstances where voting makes sense. I can’t think of any right now but I’m sure there are. However in the bulk of situations where you have a group of people trying to get to the bottom of some thorny issues, or even figure out what the thorny issues are, then voting tends to guarantee a few rather dull outcomes. So what is my problem with voting? 1. Voting kills diversity. Voting is a great tool for silencing the minority voice ensuring only majority issues get discussed. 2. Voting leads to premature consensus. The group thinks that some kind of agreement has been reached because everyone has had their chance to vote, but voting can’t replace discussion. 3. Voting creates artificial harmony. Voting is a great tool for avoiding conflict. People can hide behind their scores out of 10, but once people leave the room, you won’t have achieved commitment from everyone about the decisions reached. 4. Voting gets to the average. If you want to discuss the thing in the middle, the average, the mediocre then use voting. But for my money the interesting stuff lies at the edges, the outliers, the best and worst. 5. Voting gets gamed. Once people see how voting is working, they will game the process to get their issues discussed. And unless the voting is truly blind (it rarely is in a work situation) then you’ll get more consensus building as people follow others voting patterns. So if you see me in a meeting and my eyes glaze over next time someone suggests we vote on something you’ll know why! Tools that allow give the minority opinions a voice. Tools that avoid premature consensus by allowing the real issues to be discussed. Tools that encourage getting the conflict out in the room, so ever voice is heard and commitment increased. Tools that avoid the mediocre middle and allow the outlying cases to get air time. Tools that can’t easily be gamed. Generally speaking a conversation is as good as any. What about Deplhi-inspired methods, such as feature prioritization weighting – do you assimilate that to voting ? It does have some of the problems aforementioned, but on the other hand it structures conversations that tend to degenerate into corporate bullying. If you want to avoid unhealthy conflict (i.e. bullying) then voting works. But isn’t the answer to tackle the bullying? Your observations are spot on—in situations where voting is used for decision making. However, that is a terrible use of the tools you mention, and I’m sorry that has been your experience. The purpose of using dot or thumb voting, or even planning poker is not to make majority-rule decisions. These tools are actually intended to surface disagreements. When these are hidden we can waste a lot of time talking, and thinking we are talking about the same thing. A quick vote on a well-articulated issue shows our misalignement, and gives voice to the minority. Following such an exercise with a striving for alignment, and perhaps consent, allows teams to move forward without silencing anyone, or having some leader make decisions on behalf of the team out of sheer frustration. Far from avoiding conflict, these tools can highlight it, and allow us to embrace it through meaningful, and informed dialog. Be careful not to discard excellent dialoging tools just because they are abused by some. Used well, they can be exactly the tools you outline in your first response comment. Thanks for the comment. I think you’re spot on. I’d love to see voting used in this way and I’m sure it must be possible, but I’d still argue you have to go to some lengths to avoid premature consensus and gaming. Planning poker is possibly the best approach I’ve seen in action that works this way, but the uses are limited to estimating size, you only have to see the currently trending #noestimating movement to know things aren’t going well in this area. It seems my post has been taken as the beginnings of a #novoting movement, that’s not my intention, it’s just I find voting used by default in all meeting types, and that people don’t take the time to consider the real purpose of the meeting. I’d be happy if everyone just tried a different approach now and then, and take my concerns into account when planning how the meeting will play out, if they do include voting. I’ve also found it bizarre that two or three people have felt the need to express their “sorrow” for my experience. Why is that? I’m a hands on practitioner and have sat in a very large range of meetings, playing a wide range of roles, run by some other practitioners and some run by consultants. I wouldn’t consider my experience limited and I don’t feel bad about the experiences I have had. I just want to make meetings more engaging and productive.